Chanteur Country US né Max Duane Barnes, le 24 Juillet 1936 à Hardscratch (Iowa). 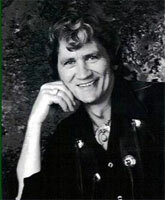 Max D. Barnes est décédé le 11 Janvier 2004 à Nashville (Tennessee). 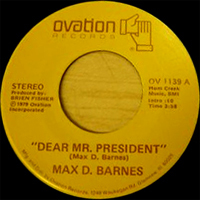 Max D. Barnes may not have released many records, but he left an important mark on contemporary country music. As a songwriter, Barnes composed many familiar songs of the '80s and '90s, receiving 42 songwriter awards in his career. Artists like George Jones ("Who's Gonna Fill Their Shoes"), Waylon Jennings ("Drinkin' and Dreamin'"), Conway Twitty ("Red Neckin' Love Makin' Night"), Keith Whitley ("Ten Feet Away"), Randy Travis ("I Won't Need You Anymore [Forever and Always]"), Vern Godsin ("Way Down Deep," "Slow Burnin' Memory"), Pam Tillis ("Don't Tell Me What to Do"), and Vince Gill ("Look at Us") have recorded his songs, as have many others. Although he has had a couple of minor hits himself (most notably "Allegheny Lady" in the mid-'70s), his true legacy lies in his songs, not his records. Barnes grew up in Iowa, receiving his first guitar from his sister Ruthie Steele at age 11. Shortly afterward, his parents were divorced. He moved to Omaha, NE, with his mother and two younger brothers. At 16, he dropped out of school and began singing in a local nightclub. During this time, he formed a band called the Golden Rockets, which featured his future wife, Patsy, as lead singer. Max and Patsy quit playing clubs after the birth of their son, Patrick. At first, Max worked for an Omaha concrete company, but the family soon moved to Long Beach, CA, where he was the foreman at a lamp factory. After a while, he quit, spending his summers in Omaha and his winters singing in California. By 1962, he saved up enough money to buy a nightclub near Lake Okiboji, IA, but he sold it after eight months. Again, the Barnes family moved back to Omaha, where Max spent nine years driving as a truck driver. Barnes' musical career didn't really begin until 1971, when he recorded a single for Jed, "Ribbons of Steel"/"Hello Honky Tonk." 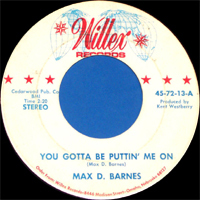 He followed it with "You Gotta Be Putting Me On"/"Growing Old With Grace," which was released on Willex. Following some words of encouragement from songwriter Kent Westberry, Barnes moved to Nashville in 1973. Barnes became a staff writer for Roz-Tense Music, which led to Charley Pride recording two of his songs. Soon, he moved to Gary S. Paxman Music, then to Danor Music. While he was with Danor, Barnes wrote nearly 30 songs recorded by other artists, including several hit singles; on one occasion, he had five of his songs on the charts simultaneously. He also co-wrote many songs with Troy Seals, one of the co-owners of the publishing company. Sadly, tragedy befell the Barnes family, as the eldest son, Patrick, died in a car accident in 1975. Max wrote about the incident on "Chiseled in Stone," which was co-written with Vern Godsin who had a hit with the song in 1989. In 1976, Barnes signed a publishing deal with Screen Gems EMI, which helped him secure a recording contract with Polydor. Released the following year, Rough Around the Edges spawned the minor hit "Allegheny Lady," which scraped the bottom of the charts. If he didn't have hits with his own records, he did have hits with his songs, as Conway Twitty brought several of Barnes' songs to the charts, including the Loretta Lynn duos "I Can't Love You Enough" and "From Seven Till Ten," and the solo "Don't Take It Away," which hit number one. 1981 SP OVATION 1164 (US) Don't Ever Leave Me Again / ? 1981 ? SP COUNTRY ROAD ? (UK) Rainbows And Roses / ?